I’ve written about growing your Facebook Likes many times before. I wrote about it here and here and here and here and here and here. So I considered not writing this post and adding to the noise. But I had to do it because what I am going to provide you today is unique and valuable. And — hey — everyone wants to know how to get more Facebook Likes! The posts I’ve written before about getting Facebook Likes are certainly helpful. Those posts provide a list of ads and strategies you can use. But never before have I offered a process. It’s taken some time, but I have adopted a process that I now use for myself and for clients to quickly and efficiently build a highly relevant Fan base without breaking the bank. No, this is not about cheap Likes in strange countries. It’s not about shady services. It’s about implementing a process to strategically target people who will flock to your Facebook Page. 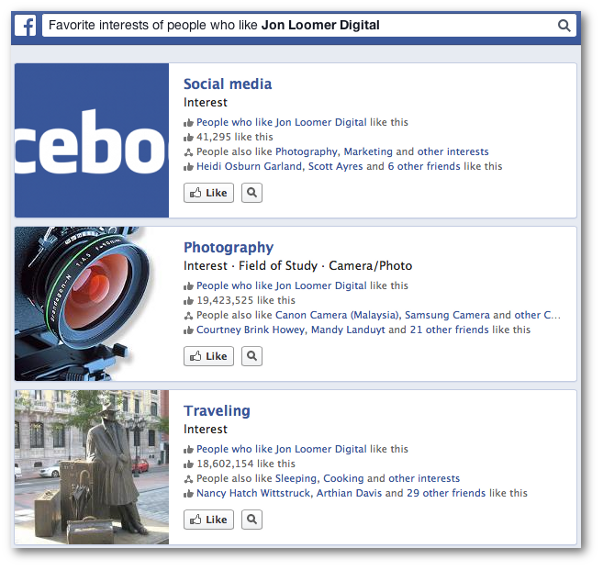 I’ve spoken before about how to use Graph Search to learn more about your Facebook Fans. But I’ve been amazed by how well this works. 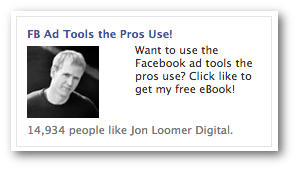 Pages liked by people who like Jon Loomer Digital and Mari Smith. I picked the biggest name I could think of to pair my Page with. I want to know the overlap. I write down all of the Pages that appear on the first page of results. And then I run the process over and over again. Favorite Interests of people who like Jon Loomer Digital and Mari Smith. I again run this process repeatedly. This time, though, I make sure to filter out anything that is too broad and clearly not relevant (like Traveling). Then I go into Power Editor and create a Saved Audience. I add the Pages and interests that made the cut. Notice that I did not include any hashtag interests to make it broader. I don’t want to target people who like something related to these Pages and interests (which is what happens when you use the hashtag), I want these Pages and interests only. The countries I chose are reflective of what I see in my Facebook Insights. Focus on where your Fans are from, whom you reach and who engages with your content. You could target only English speaking people at this point, too. I’ve chosen not to. This Saved Audience is created. Hang onto it, we’ll use it later. Normally I would list creating a Custom Audience first — I love Custom Audiences — but I’m going backwards here because I want to focus first on a completely different audience. I fact, I’m not going to include Custom Audiences in this list at all because my intention is to find completely new people who were not previously exposed to your brand. You’ve hopefully already created a Custom Audience. This involves uploading your email list (or other customer list) into Power Editor so that you can target ads at these people, regardless of whether they are Fans (powerful stuff!). But I’d neglected Lookalike Audiences until recently. I wasn’t seeing great results. And I recently realized why. Previously when I created Lookalike Audiences, I was adding targeting to make it far too fine. I wasn’t trusting Facebook’s algorithm that already determined that these users were similar to my customers. As a result, the audience was small and ineffective. I learned from that, and you’ll learn from my mistakes. 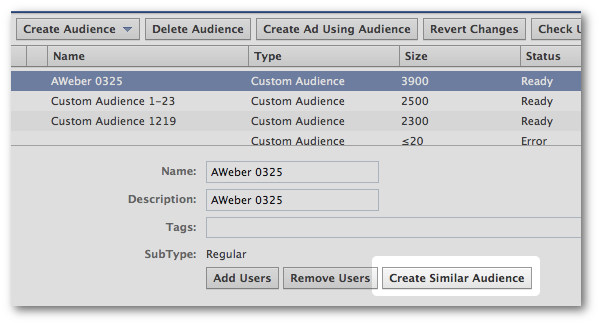 To create a Lookalike Audience, highlight your Custom Audience in Power Editor and click the “Create Similar Audience” button. 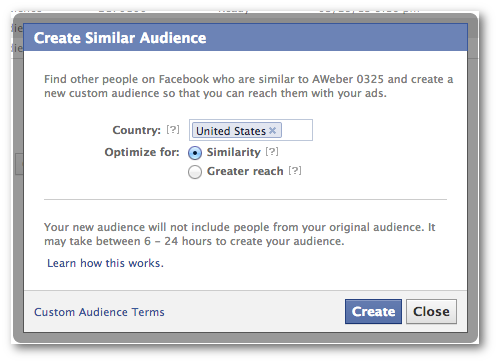 Then have Facebook create a Lookalike Audience based on similarity (the top 1% of users similar to your Custom Audience). Do this for every country that fits your broader audience. Again, I used my top six countries. Once again, put this aside. You need to keep these Sponsored Stories separate because Facebook may otherwise decide too soon to go with one over the other. For everything else, I went with defaults. For the Lookalike Audience ad, I included all six audiences that I created (one for each country). Now run these Sponsored Stories at a budget high enough or a period long enough to learn from the results. We’ll get to that later. Now create a standard Facebook ad that attracts the same audiences as in the previous step. This time, you’ll use something of value as bait. If they click on the ad instead of immediately liking, they are directed to my Facebook tab where they are instructed to like my Page to get free access to the eBook. Feel free to do something similar. Think of something you can create of value that you can give away in exchange for liking your Page. By the way, I use ShortStack (aff.) to create these like gated tabs. Reminder: Create separate campaigns, one for your Lookalike Audiences and one for the similar Pages and Interests. And don’t forget to keep the targeting broad! Now it’s time to optimize! If you haven’t yet started using the new Facebook advertising reports, you need to start now. It’s an absolutely amazing tool that can make your advertising a whole lot easier (and save you money in the process!). Now you should create three reports that help you quickly see what is working. All three reports should filter out the campaigns that you just created. The difference is what you select in the Data Breakdowns setting. Through this process, I recently discovered I was getting 14 cents per Like on my Similar Pages & Interests Sponsored Story among people in the United Kingdom. That same group was getting me 22 cents per like on my eBook giveaway. But I also realized that I was spending too much for certain groups and in certain placements. These are things that are now very easy to determine within the new ad reports. So, what do you do with this information? You stop the original ads and create new, optimized ads that focus on the areas that are working. That’s the process I’m using that I’m finding incredibly effective. Anything else you’d add?